We all love villains don’t we? 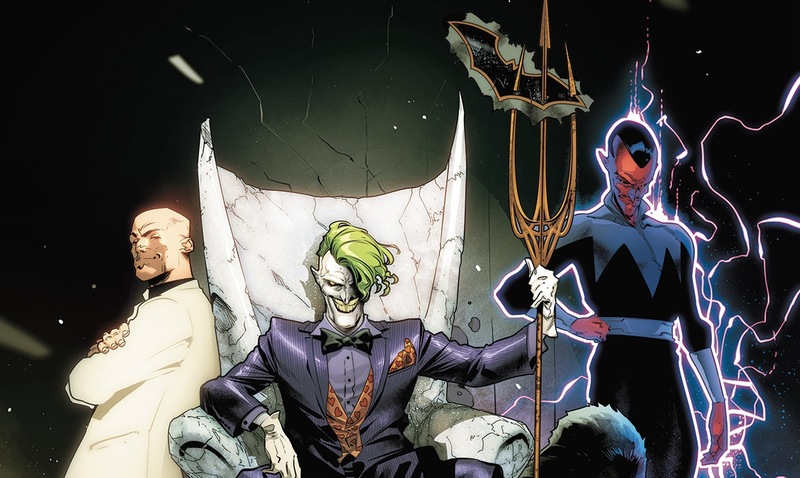 Whether secretly or openly, it’s hard to deny that the Legion of Doom have charisma baked into their DNA with this latest iteration of Justice League. Despite the fact that scenes with Lex Luthor and Black Manta follow the trope of bad guys monologuing but that’s honestly what makes these sections great. James Tynion IV channels the energy of classic comics but with a modern sensibility. The Legion of Doom retain their intimidation factor but retain their silliness, I know that those two factors should contrast with each other but they don’t. Tynion understands that balance is key for these iconic characters. Knowing when to push the pedal to the medal and when to pump the breaks. I’m not the biggest fan of villains taking center stage withing a comic but I’ll make an exception for this iteration of The Legion of Doom. With this being the midway point, the comic follow a typical structure of the heroes turning the tide after learning a harrowing secret. It’s nothing terrible and it shouldn’t ruin the comic for anyone but the pacing is what might drag readers down. Since this comic has to deal with the most exposition that we’ve seen since the first issue, the action does understandably so take a slight step backwards. We’re still treated to amazing set pieces within this chapter of “Drowned Earth”. With that being said, even though the pacing is slowed down a bit, the story doesn’t lack intensity. Tynion continues the theme of overwhelming sense of dread that started with the first issue, a race against time with time running out. It might always be prevalent within each scene. but it’s felt throughout the entire issue. The only real criticism I have is the dual artist and how they’re inconsistently used. Both Frazier Irving and Bruno Redondo art within this issue are absolutely stunning. At first I thought Frazier Irving would draw the sections with Aquaman, Wonder Woman, and Poseidon because Irving’s art has such a surreal style to it. While I don’t mind seeing more of Irving’s art, to then see he would draw Mera, Flash, and Superman’s scenes just make the book not gel well. As beautiful as Redondo’s art is. it doesn’t mesh well with Irvining’s art at all. Redondo’s storytelling despite everything is excellent, the charisma of the Legion of Doom is out in full force with his pencils. The biggest crime of this comic is having two artist with different styles work on the same book. I understand that the book needs to come out but I would like to think fans wouldn’t mind waiting if either Irving or Redondo worked on the entire issue. Even though this wasn’t my favorite chapter of Drowned Earth, as part of the overall story I still enjoyed this issue despite the dual artists. Finally while I’m usually against references in comics, seeing Black Manta yell RELEASE THE DEATH KRAKEN while a giant Kraken rises from the ocean depths is a reference that I’m perfectly okay with. More Death Kraken please.